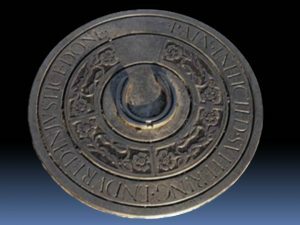 The old Paisley Tolbooth is on the corner of High Street and Moss Street and was given to the Burgh in 1491 by Abbot George Shaw. In 1610 (Image Left) it was rebuilt due to its dilapidated condition. It served the purposes of the Municipal Building where the official Weights & Measures of the town were held in order to check on traders also acted as Burgh Courthouse and Town Jail. 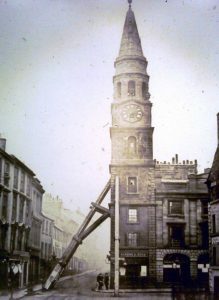 Two further re-buildings took place in 1751 and 1882, it was during 1868, however the foundation work for a building being erected adjacent to the Tolbooth seriously undermined its stability and two years later it had to be demolished. 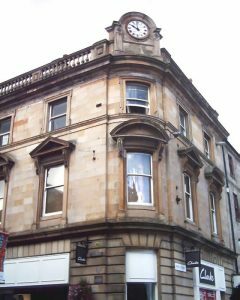 (Image right) to make way for the City of Glasgow Bank built in the 1870s. The bank has gone and is now occupied by shops. “Pain Inflicted,Suffering Endured, Injustice Done“. Click the link on the map pins to get a taster on the sites available. Enter any additional questions / information here.